Repeat after me: Mental health is health. Mental illness is illness. Brain is body. I suspect John Piper would cringe to think he has something in common with the Copelands but turning mental health into a spiritual fruit is in that ballpark. Copeland says soldiers can get rid of their PTSD with a dose of Scripture. Desiring God prescribes a spiritual refocus as if those who are mentally healthy are spiritually sound. Perhaps I am sensitive to this message due to my clinical experience with Christians. I have seen the damaging effects of messages like this and know how Christians with mental health diagnoses hear this. Tweets like the one from Desiring God reinforce the misconception that mental health conditions can be overcome by willpower or positive thinking. Those who struggle have to deal with their illness and the stigma from those in the church who spiritualize their illness. Although beyond the scope of this post, an important issue is that, generally speaking, evangelicals have not grappled with the reality of brain as body. Consciousness arises from brain and does not reside in a spiritual substance independent of body. Like it or not, if you don’t deal with this, I don’t think you understand who we are as human beings. Knock out certain parts of our brain and we become different people. I don’t think I have ever heard a sermon or Sunday school series on the religious significance of our brains. Some people using the Tweet advice will find comfort because they have positive associations in their brains to images of God which might take their minds off a negative personal preoccupation. However, someone else with different brain chemistry and history may not make the same associations. They may try to work their brains in the same way, but due to something out of their conscious control, their feelings do not respond in the same way. They do not and cannot find mental health no matter how long they stop staring in the mirror. When those who don’t succeed with anti-mirror therapy go to church, they feel even worse because their faith is questioned. They are told, even if subtly or indirectly, that they don’t have enough faith. If they just believed harder or put God first, or dealt with the sin in their lives, then the advice would work. Occasionally, bouts of depression are triggered by obvious catalysts, like losing a job or loved one or some kind of overt trauma. Often, though, nothing is “wrong”. We’re not upset or sad or angry or stressed about anything particular, but our body is deploying hormones as though we’re being attacked. It is these episodes that are most frustrating to the friends and family of people who have depression; they don’t know what to do to help because there’s seemingly nothing wrong. The victims of those moments find it doubly frustrating, as a silent, crushing dread slowly bears down on our souls, challenging us to find a name for it. This frustration is compounded by Christians conflating mental health with spiritual status. If the Desiring God tweet had said enlightenment or satisfaction or something other than mental health would come from staring at God’s beauty, that would be fine. I hope John Piper and his crew will pull that tweet and clarify that they are not the Copelands. Stop seeking mental health in the mirror of self-analysis, and start drinking in the remedies of God in nature. This isn’t at all what Desiring God originally tweeted. The “remedies of God in nature” could easily refer to medication or therapy or an experience in nature. Since Piper quoted it approvingly I don’t really know what Kilby meant. In any case, I am less concerned with the Kilby article and more concerned with the spin engaged in by whoever is running the Twitter account at Desiring God. Since October 2017, over 2300 Texans have died due to the flu. In the face of that fact, Gloria Copeland, wife of word of faith preacher Kenneth Copeland, took to Kenneth Copeland Ministries’ Facebook page yesterday to declare that there is no flu season. We’ve already had out shot. He bore out sicknesses and carried our diseases. That’s what we stand on. And by His stripes, we are healed. Jesus Himself gave us the flu shot. He redeemed us from the curse of flu. And we receive it and we take it and we are healed by His stripes. It’s NOT flu season! Yes, you heard it right. The flu is NOT a season we have around here because Jesus bore ALL our sickness on the cross. This includes the flu! If you’re overcoming the flu right now, listen in as Gloria prays for YOU! Are you believing for a miracle in your health? Join us for Miracles on the Mountain, Feb. 16-17 with Healing Evangelist Billy Burke. Admission is FREE. Learn more and register here: kcm.org/miracles18. This is probably tame, run of the mill advice for a faith healing ministry. However, it is so obviously fake and irresponsible to direct people away from flu shots. And it isn’t the first time that Copeland’s teachings have been implicated in discouraging vaccines. On Kenneth Copeland’s website, you can find 10 verses to help you take a stand against the flu. No advice to see a doctor or get a flu shot can be found. The flu is at high level nationally and if you haven’t had a flu shot, go get one. And that includes you Gloria. Tennessee Governor Signs Bill Allowing Counselors To Refer Based On Counselor's "Sincerely Held Principles"
“Although Senate Bill 1556 has received attention for its perceived focus, my job is to look at the actual substance of the legislation. After considerable thought and discussion with counselors both for and against the bill, I have decided to sign Senate Bill 1556. There are two key provisions of this legislation that addressed concerns I had about clients not receiving care. First, the bill clearly states that it ‘shall not apply to a counselor or therapist when an individual seeking or undergoing counseling is in imminent danger of harming themselves or others.’ Secondly, the bill requires that any counselor or therapist who feels they cannot serve a client due to the counselor’s sincerely held principles must coordinate a referral of the client to another counselor or therapist who will provide the counseling or therapy,” Haslam said. The bill was signed by the speakers on April 13 and transmitted to the governor for action on April 15. The bill language is available at http://www.capitol.tn.gov/Bills/109/Amend/HA1006.pdf. While I appreciate the amendments requiring care in cases of homicidal or suicidal risk, I don’t support this bill. This bill allows discriminatory actions toward anyone, including religious people, based on a vague condition of a counselor’s conflict involving “sincerely held principles.” While I believe some conflicts could be so great that a referral would be the best course of action in the immediate situation, this bill points counselors in another direction. For mental health care to be fully integrated with health care, a value of treating all people is required. I don’t want a health care system where providers are allowed to delay care based on personal disagreements with patients. I do think providers should be allowed to decline performing certain treatments (e.g., abortion, hypnosis, EMDR, etc.) but I don’t think a referral based on personal disagreement should be the norm in health care. Author Warren ThrockmortonPosted on April 30, 2016 Categories health, health care, mental healthTags Governor Bill Haslam, referral bill, TennesseeLeave a comment on Tennessee Governor Signs Bill Allowing Counselors To Refer Based On Counselor's "Sincerely Held Principles"
Sometime in 2013, Mercury One, a non-profit founded by Glenn Beck but run by principal officer David Barton, gave $100,000 to Barton’s Wallbuilders, also a non-profit run by Barton. Such gifts appear to be questionable under IRS guidelines addressing gifts which benefit insiders. Barton founded and is head of Wallbuilders, and was recently tapped to run the Keep the Promise group of Super PACs with over $38 million to spend supporting Ted Cruz. For purposes of this item, “principal officer” means an officer of the organization who, regardless of title, has ultimate responsibility for implementing the decisions of the organization’s governing body, or for supervising the management, administration, or operation of the organization. Thus, if Mercury One filed the 990 properly, Barton has ultimate responsibility for operating the non-profit. Without examining anything else, that is a noteworthy finding. Barton is also listed as officer along with only two other board members, Glenn Beck’s wife and his longtime attorney and researcher, Joseph Kerry. Certainly by the standards of the Evangelical Council for Financial Accountability, this is an unacceptable composition for a board. None of these people are independent and it seems improper for Kerry to assume three positions. As principal officer, Barton only needs one other person to vote with him to do anything. Later, the 990 reports that Wallbuilders received $100, 000. This gift accounts for about 7.5% of the income Wallbuilders received in gifts and grants in 2013. According to the IRS, non-profits are for the public interest and not private interest. A public charity is prohibited from allowing more than an insubstantial accrual of private benefit to individuals or organizations. This restriction is to ensure that a tax-exempt organization serves a public interest, not a private one. If a private benefit is more than incidental, it could jeopardize the organization’s tax-exempt status. No part of an organization’s net earnings may inure to the benefit of an insider. An insider is a person who has a personal or private interest in the activities of the organization such as an officer, director, or a key employee. This means that an organization is prohibited from allowing its income or assets to accrue to insiders. An example of prohibited inurement would include payment of unreasonable compensation to an insider. Any amount of inurement may be grounds for loss of tax-exempt status. If a public charity provides an economic benefit to any person who is in a position to exercise substantial influence over its affairs (that exceeds the value of any goods or services provided in consideration), the organization has engaged in an excess benefit transaction. 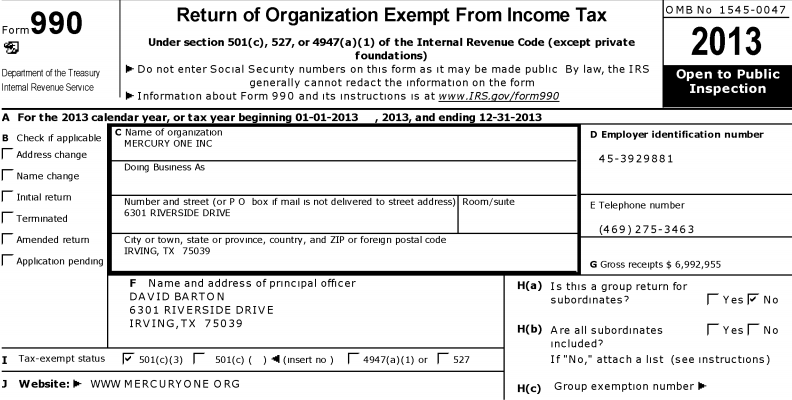 A public charity that engages in such a transaction must report it to the IRS. Excise taxes are imposed on any person who engages in an excess benefit transaction with a public charity, and on any organization manager who knowingly approves such a transaction. (See Reporting Excess Benefit Transactions on page 12). Only the IRS can make a final determination but this transaction looks like it is worth exploring. Barton certainly is an insider at Mercury One and, via Wallbuilders, he benefited from the gift. The $100,000 is almost as much as Barton reported as compensation in 2013. Clearly John Catanzaro hopes people don’t read the actual settlement reached with the Department of Health. Catanzaro makes it seem like he did the Department of Health a favor and he did nothing wrong. However, he stipulated to deceiving the Department and he has to pay former patients $180,750 to cover the costs of vaccines he charged for but did not administer. Catazaro admitted to the same charges made back in January. Here is just one in which he agrees with the Department of Health that his treatment was not safe and he engaged in unprofessional conduct. Catanzaro is pretty brazen; he still has to apply for reinstatement and yet he is counting his vaccines before they are hatched. Subtitle: Conservatives Against Crazy Therapies #savethepillows (see video below). Right wing website The College Fix misses the point in an article published last Friday (6/20). The assumption on the part of Chris Doyle and author Claire Healey seems to be that incorrect information provided by college counseling or resource centers should lead to the addition of more incorrect information at those same centers. In other words, since LGBT centers say some things that might be inaccurate or can’t be proven, ex-gay supporters should be allowed to do the same thing. This is not “right-minded” but rather wrong-headed. Doyle can’t offer any evidence for his claims, and as his campaign shows, his group is hardly voiceless. Conservatives should not react in a knee jerk fashion against what seems like viewpoint discrimination to simply offer what seems to be the opposite position (e.g., gay groups say gays can’t change, conservative groups then should support the notion that gays can change). What seems like the opposite position of the position you don’t like is not of necessity the correct one. In this case, it is true that research has not found a consensus around the causes of homosexuality. However, that does not mean that Doyle’s version of weak fathering and overbearing mothering is correct. In fact, that model doesn’t have support in research. There are many good empirical reasons to question that model for most gays. Doyle’s therapy approach is based on that causal model which, in addition to the absence of any empirical support, opens it up to skepticism. Two wrongs don’t create a “right-minded” stance and is a loser as a conservative position. Sorry, can’t imagine a college promoting this anti-science brand of ex-gay therapy but that is what Doyle’s IHF is known for. On Saturday (May 10), the Everett (WA) Daily Herald carried an article following up on naturopath John Catanzaro’s response to the suspension of his license in January over cancer vaccines provided by his clinic. Although not a focus of the complaints against him, Catanzaro also claimed to have a professional relationship with the University of Washington and the Dana Farber Cancer Institute at Harvard University. Both institutions denied any connection to Catanzaro and Dana Farber Cancer Institute demanded that Catanzaro stop claiming that he was working with the clinic. Subsequently, all references to Dana Farber as well as to the University of Washington disappeared from his materials without explanation. According to the DailyHerald, Catanzaro has launched a website to defend himself and serve as a platform to raise money. His defense now is in the court of public opinion, but his formal hearing before the naturopath board is not slated to take place until August 6-8 of this year. It is unclear why unused vaccines would require payments from patients. Patients pay as they go for treatments and if the vaccines are not going to be used, the clinic might suffer loss but the patients should only have to pay for what they use. Furthermore, Catanzaro’s non-profit arm seems to have sufficient resources to cover these research costs. 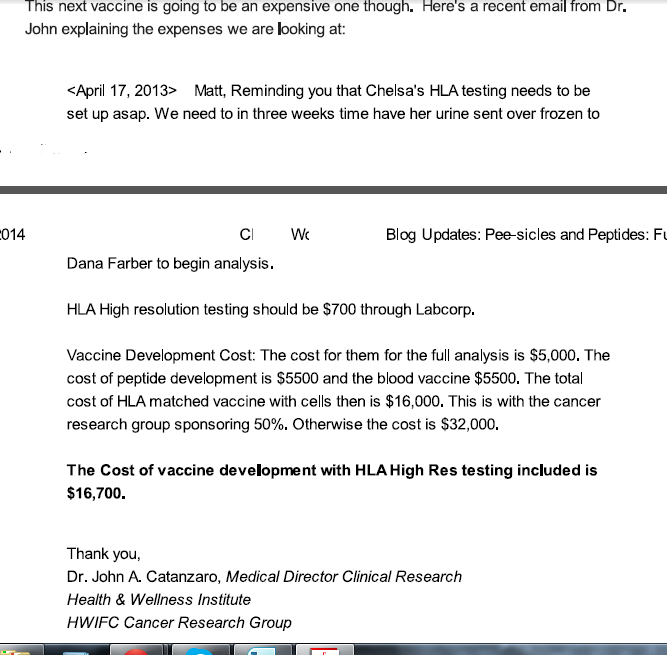 According to the 2012 990 for the HWIF Cancer Research Group, the organization set up to fund vaccine research, the organization had a fund balance of $818, 301. The document demonstrates that revenues from program fees exceeded clinic expenses by just over $300,000 in 2012. Perhaps 2013 was a leaner year (the 990 is not available) but it appears that the non-profit should be able to step in for patients. In the media coverage since Catanzaro’s suspension, additional questions are still unanswered. Catanzaro has yet to address why he told the public that he had working relationships with the University of Washington and the Dana Farber Cancer Institute at Harvard University. While he removed these references from his website after the lack of relationships came to light, he has not addressed the claims that he needed funds from clients to secure the services of Dana Farber. Dana Farber denied performing these services. His relationship to his non-profit organization raises questions as well. According to the state of Washington, he is a director of the HWIFC Cancer Research Group, but his name does not show up as an officer or key employee on the organization’s IRS 990 report. According to the most recent 990, two of his employees, his wife and his accountant make up four of the six board members. As with the 2011 990, the 2012 report also shows significant transactions between the non-profit organization and Catanzaro’s for profit business. Seattle Times health reporter Carol Ostrom filed a report today regarding suspended Seattle naturopath John Catanzaro. Regular readers here will recognize similar themes in this report but see some important new information as well. The article leads with his suspension and notes that he has until March 14th to appeal. Originally, Catanzaro had 20 days to appeal but he filed a motion for an extension of time to prepare his appeal which was granted by a Seattle judge last week. According to Department of Health spokeswoman, Kelly Stowe, Catanzaro is not supposed to engage in the practice of naturopathic medicine while his license is suspended. However, according to his website, he appears to be continuing his practice. The article also confirmed the reporting here and at Wartburg Watch that Catanzaro once claimed a relationship with Dana-Farber Cancer Institute, but in fact, has no relationship with the clinic and that DFCI has asked Catanzaro to stop using the name in his materials. According to Ostrom’s reporting, Mark Driscoll praised Catanzaro’s treatments which led to others in the church to seek out his services. Some former MHC members have related to me that Driscoll has stated publicly that the IV vitamin treatments cost over $1,000 each. The Times article also delves into Catanzaro’s fundraising methods a bit. As the Times notes, patients have set up accounts to solicit funds for their individual care. While this is permitted, the donations may not be tax deductible as IRS rules (see page 6) appear to disallow donations which are earmarked for one person’s care. 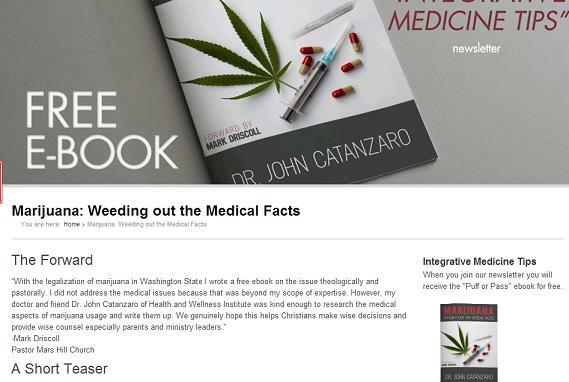 On his website yesterday, John Catanzaro, Mark Driscoll’s naturopath, partially addressed the growing controversy surrounding his license suspension. As many of you know, the Washington Department of Health (WA DOH) has raised concerns about our use of experimental autologous peptide vaccine in research. We disagree with the WA DOH and are appealing. We are working diligently with our legal team on our appeal. We continue to provide personalized wellness and cancer care and all of our physicians, nurse team and admin team are here to serve you. There will be no interruption in our ability to provide you excellent quality care. We want to sincerely thank you for your support and understanding during this difficult time. Our admin team can assist you in identifying ways you can support us during this process. The Washington Department of Health did more than raise “concerns.” The naturopath board suspended his license to practice. In contrast to the message of “no interruption,” he is not supposed to practice while it is suspended. According to the Washington board, he has until Monday, February 17 to appeal. Catanzaro only partially addressed issues which have been raised. 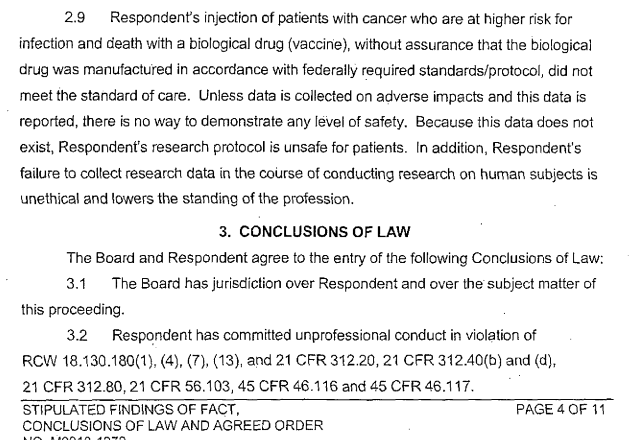 Prior to the state board’s action, Catanzaro claimed to have a collaborative relationship with Dana Farber Cancer Institute, Ken Anderson an oncologist at DFCI, and the University of Washington for the purpose of developing cancer vaccines. In recent days, DFCI, Ken Anderson and UW have denied collaboration with Catanzaro or his clinic. If I was considering alternative care, this would be a huge red flag for me. Another question is how naturopaths in this group are able to treat cancer at all. 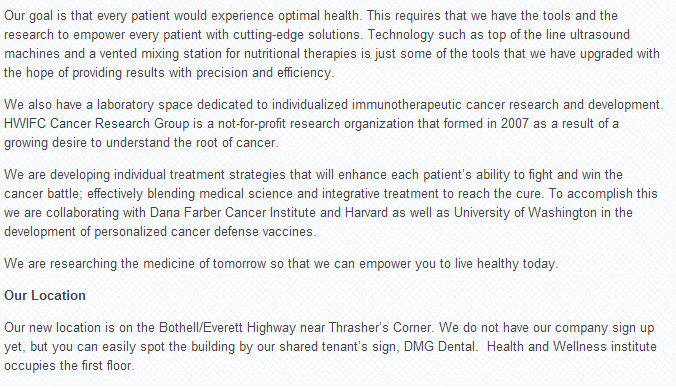 Naturopaths must work collaboratively with a MD or DO in order to treat malignancies in the state of Washington. * None of the medical staff listed on the website are credentialed as a MD or DO. *WAC 246-836-210 (4) Naturopathic physicians may not treat malignancies except in collaboration with a practitioner licensed under chapter 18.57 or 18.71 RCW. Click the link to read the State of Washington complaint. The other reference to DFCI was on Catanzaro’s Linked In page, and now that is missing as well. Mark Driscoll’s foreward to Catanzaro’s book was once on the HWIFC website, but isn’t now. Once Catanzaro promoted Driscoll’s ebook, Puff or Pass? as a free gift for subscribing to the HWIFC newsletter. Now it is missing. Here is another page still up on Facebook where Catanzaro is referred to as a “licensed physician.” However, if you click the link in this Facebook post you come to an empty page on The Resurgence website. To see all posts on this topic, click this link. *UPDATE: This comment was added after this article was posted.